We are going to water color a background for the Truffula trees that we are going to make. Here is the Lorax made of out construction paper. The Lorax and Truffula tree craft! I am going to attach a writing assignment to the project too! So cute! Love the Truffula tree craft! Every one is so excited for The Lorax. These crafts are great! 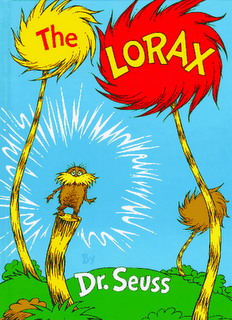 If you are interested, I would love for you to post a link on my blog, Happy Birthday Author, to help us celebrate Dr. Seuss's birthday! Such a cute idea! I have been racking my brain for days on what Seussy art we can make. This looks very promising! Thanks for being so creative - and sharing! Cute! Love the watercolor background idea. Thanks so much for sharing! I have given you the Liebster award! It's a great recognition for new bloggers. Your blog is cute and I just joined you. Go to my link and you'll see how to grab the award and follow the directions. Cute Lorax fun! Love the teeth activities below, too! Just found your blog and followed! Come visit soon!